Ensure accuracy when prescribing, dispensing, and administering Methadone Hydrochloride Oral Solution. Dosing errors due to confusion between mg and mL, and other methadone hydrochloride oral solutions of different concentrations can result in accidental overdose and death [see Dosage and Administration (2.2), Warnings and Precautions (5.1)]. Methadone Hydrochloride Oral Solution exposes patients and other users to the risks of opioid addiction, abuse, and misuse, which can lead to overdose and death. Assess each patient’s risk prior to prescribing Methadone Hydrochloride Oral Solution, and monitor all patients regularly for the development of these behaviors or conditions [see Warnings and Precautions (5.2)]. Serious, life-threatening, or fatal respiratory depression may occur with use of Methadone Hydrochloride Oral Solution. The peak respiratory depressant effect of methadone occurs later, and persists longer than the peak analgesic effect, especially during the initial dosing period. Monitor for respiratory depression, especially during initiation of Methadone Hydrochloride Oral Solution or following a dose increase [see Warnings and Precautions (5.4)]. Accidental ingestion of even one dose of Methadone Hydrochloride Oral Solution, especially by children, can result in a fatal overdose of methadone [see Warnings and Precautions (5.4)]. QT interval prolongation and serious arrhythmia (torsades de pointes) have occurred during treatment with methadone. Most cases involve patients being treated for pain with large, multiple daily doses of methadone, although cases have been reported in patients receiving doses commonly used for maintenance treatment of opioid addiction. Closely monitor patients with risk factors for development of prolonged QT interval, a history of cardiac conduction abnormalities, and those taking medications affecting cardiac conduction for changes in cardiac rhythm during initiation and titration of Methadone Hydrochloride Oral Solution [see Warnings and Precautions (5.5)]. Neonatal opioid withdrawal syndrome (NOWS) is an expected and treatable outcome of use of Methadone Hydrochloride Oral Solution during pregnancy. NOWS may be life-threatening if not recognized and treated in the neonate. The balance between the risks of NOWS and the benefits of maternal Methadone Hydrochloride Oral Solution use may differ based on the risks associated with the mother’s underlying condition, pain or addiction. Advise the patient of the risk of NOWS so that appropriate planning for management of the neonate can occur [see Warnings and Precautions (5.6)]. The concomitant use of Methadone Hydrochloride Oral Solution with all cytochrome P450 3A4, 2B6, 2C19, 2C9 or 2D6 inhibitors may result in an increase in methadone plasma concentrations, which could cause potentially fatal respiratory depression. In addition, discontinuation of concomitantly used cytochrome P450 3A4, 2B6, 2C19, or 2C9 inducers may also result in an increase in methadone plasma concentration. Follow patients closely for respiratory depression and sedation, and consider dosage reduction with any changes of concomitant medications that can result in an increase in methadone levels [see Warnings and Precautions (5.7), Drug Interactions (7)]. Concomitant use of opioids with benzodiazepines or other central nervous system (CNS) depressants, including alcohol, may result in profound sedation, respiratory depression, coma, and death [see Warnings and Precautions (5.8), Drug Interactions (7)]. Reserve concomitant prescribing of Methadone Hydrochloride Oral Solution and benzodiazepines or other CNS depressants for use in patients for whom alternatives to benzodiazepines or other CNS depressants are inadequate. These highlights do not include all the information needed to use METHADONE HYDROCHLORIDE ORAL SOLUTION safely and effectively. See full prescribing information for METHADONE HYDROCHLORIDE ORAL SOLUTION. Because of the risks of addiction, abuse, and misuse with opioids, even at recommended doses, and because of the greater risks of overdose and death with long-acting opioids, reserve Methadone Hydrochloride Oral Solution for use in patients for whom alternative treatment options (e.g., non-opioid analgesics or immediate-release opioids) are ineffective, not tolerated, or would be otherwise inadequate to provide sufficient management of pain. Methadone Hydrochloride Oral Solution is not indicated as an as-needed (prn) analgesic. Risk of Life-Threatening Respiratory Depression in Patients with Chronic Pulmonary Disease or in Elderly, Cachectic, Debilitated Patients: Monitor closely, particularly during initiation and titration (5.9). To report SUSPECTED ADVERSE REACTIONS, contact VistaPharm, Inc., at 1-888-655-1505 or FDA at 1-800-FDA-1088 or www.fda.gov/medwatch. Because of the risks of addiction, abuse, and misuse with opioids, even at recommended doses, and because of the greater risks of overdose and death with long-acting opioids [see Warnings and Precautions (5.2)], reserve Methadone Hydrochloride Oral Solution for use in patients for whom alternative analgesic treatment options (e.g., non-opioid analgesics or immediate-release opioid analgesics) are ineffective, not tolerated, or would be otherwise inadequate to provide sufficient management of pain. Code of Federal Regulations, Title 42, Sec 8: Methadone products when used for the treatment of opioid addiction in detoxification or maintenance programs, shall be dispensed only by opioid treatment programs (and agencies, practitioners or institutions by formal agreement with the program sponsor) certified by the Substance Abuse and Mental Health Services Administration and approved by the designated state authority. Certified treatment programs shall dispense and use methadone in oral form only and according to the treatment requirements stipulated in the Federal Opioid Treatment Standards (42 CFR 8.12). See below for important regulatory exceptions to the general requirement for certification to provide opioid agonist treatment. During inpatient care, when the patient was admitted for any condition other than concurrent opioid addiction (pursuant to 21CFR 1306.07(c)), to facilitate the treatment of the primary admitting diagnosis. 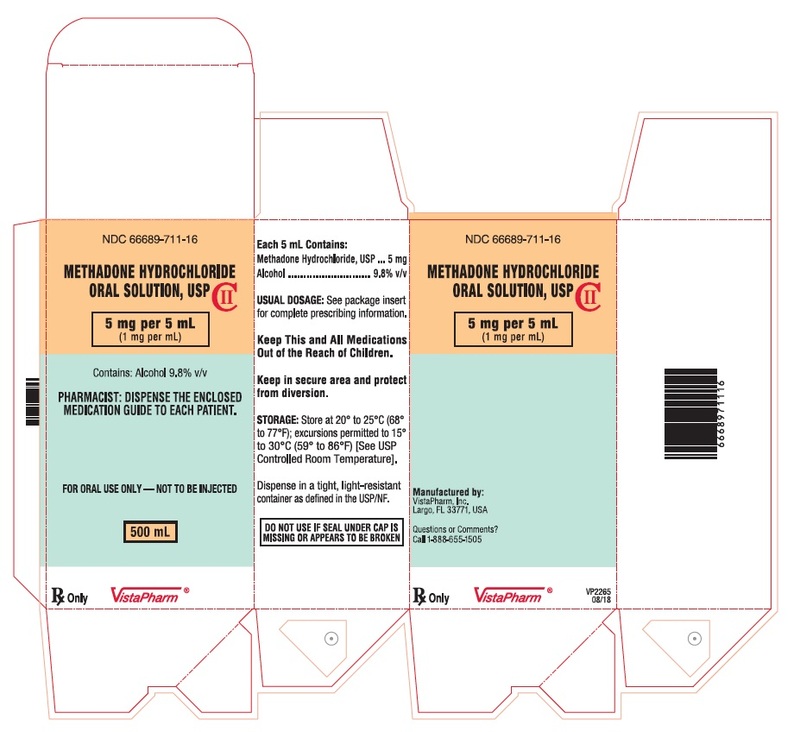 Ensure accuracy when prescribing, dispensing, and administering Methadone Hydrochloride Oral Solution to avoid dosing errors due to confusion between mg and mL, and with other methadone hydrochloride oral solutions of different concentrations, which could result in accidental overdose and death. Ensure the proper dose is communicated and dispensed. When writing prescriptions, include both the total dose in mg and the total dose in volume. Always use a calibrated measuring device when administering Methadone Hydrochloride Oral Solution to ensure the dose is measured and administered accurately. Healthcare providers should recommend a dropper that can measure and deliver the prescribed dose accurately, and instruct caregivers to use extreme caution in measuring the dosage. Methadone Hydrochloride Oral Solution should be prescribed only by healthcare professionals who are knowledgeable in the use of potent opioids for the management of chronic pain. Initiate the dosing regimen for each patient individually, taking into account the patient’s severity of pain, patient response, prior analgesic treatment experience and risk factors for addiction, abuse, and misuse [see Warnings and Precautions (5.2)]. Monitor patients closely for respiratory depression, especially within the first 24-72 hours of initiating therapy and following dosage increases with Methadone Hydrochloride Oral Solution and adjust the dosage accordingly [see Warnings and Precautions (5.4)]. Initiate treatment with Methadone Hydrochloride Oral Solution with 2.5 mg orally every 8 to 12 hours. Discontinue all other around-the-clock opioid drugs when methadone therapy is initiated. Deaths have occurred in opioid-tolerant patients during conversion to methadone. The potency of methadone relative to other opioid analgesics is nonlinear and increases with increasing dose. Table 1 provides an estimated conversion factor for use when converting patients from another opioid to methadone. Because of the high inter-patient variability in absorption, metabolism, and relative potency, it is critical to avoid overestimating the methadone dose which can lead to fatal respiratory depression. It is safer to underestimate a patient's 24-hour methadone dosage and provide rescue medication (e.g., immediate-release opioid) than to overestimate the 24-hour methadone dosage and manage an adverse reaction due to an overdose. The conversion factors in this table are only for the conversion from another oral opioid analgesic to Methadone Hydrochloride Oral Solution. The table cannot be used to convert from Methadone Hydrochloride Oral Solution to another opioid. Doing so will result in an overestimation of the dose of the new opioid and may result in fatal overdose. Always round the dose down, if necessary, to the appropriate Methadone Hydrochloride Oral Solution strength(s) available. Step 2: Calculate the approximate equivalent dose of Methadone Hydrochloride Oral Solution based on the total daily dose of Morphine using Table 1. Step 3: Calculate the approximate starting dose of Methadone Hydrochloride Oral Solution to be given every 12 hours. Round down, if necessary, to the appropriate methadone tablets strengths available. Close observation and frequent titration are warranted until pain management is stable on the new opioid. Monitor patients for signs and symptoms of opioid withdrawal or for signs of oversedation/toxicity after converting patients to Methadone Hydrochloride Oral Solution. Use a conversion ratio of 1:2 mg for parenteral to oral methadone (e.g., 5 mg parenteral methadone to 10 mg oral methadone). Individually titrate Methadone Hydrochloride Oral Solution to a dose that provides adequate analgesia and minimizes adverse reactions. Continually reevaluate patients receiving Methadone Hydrochloride Oral Solution to assess the maintenance of pain control and the relative incidence of adverse reactions, as well as monitoring for the development of addiction, abuse, or misuse [see Warnings and Precautions (5.2)]. Frequent communication is important among the prescriber, other members of the healthcare team, the patient, and the caregiver/family during periods of changing analgesic requirements, including initial titration. During chronic therapy, periodically reassess the continued need for the use of opioid analgesics. Patients who experience breakthrough pain may require a dose increase of Methadone Hydrochloride Oral Solution, or may need rescue medication with an appropriate dose of an immediate-release analagesic. If the level of pain increases after dose stabilization, attempt to identify the source of increased pain before increasing the Methadone Hydrochloride Oral Solution dosage. Because of individual variability in the pharmacokinetic profile (i.e., terminal half-life (T1/2) from 8 to 59 hours in different studies [see Clinical Pharmacology (12.3)]), titrate Methadone Hydrochloride Oral Solution slowly, with dose increases no more frequent than every 3 to 5 days. However, because of this high variability, some patients may require substantially longer periods between dose increases (up to 12 days). Monitor patients closely for the development of potentially life-threatening adverse reactions (e.g., CNS and respiratory depression). When a patient no longer requires therapy with Methadone Hydrochloride Oral Solution for pain, taper the dose gradually, by 15% to 50% every two to four days, to prevent signs and symptoms of withdrawal. If the patient develops these signs or symptoms, raise the dose to the previous level and taper more slowly, either by increasing the interval between decreases, decreasing the amount of change in dose, or both. Do not abruptly discontinue Methadone Hydrochloride Oral Solution [see Warnings and Precautions (5.16), Drug Abuse and Dependence (9.3)]. For detoxification and maintenance of opioid dependence methadone should be administered in accordance with the treatment standards cited in 42 CFR Section 8.12, including limitations on unsupervised administration. Administer the initial methadone dose under supervision, when there are no signs of sedation or intoxication, and the patient shows symptoms of withdrawal. An initial single dose of 20 to 30 mg of Methadone Hydrochloride Oral Solution will often be sufficient to suppress withdrawal symptoms. The initial dose should not exceed 30 mg.
To make same-day dosing adjustments, have the patient wait 2 to 4 hours for further evaluation, when peak levels have been reached. Provide an additional 5 to 10 mg of Methadone Hydrochloride Oral Solution if withdrawal symptoms have not been suppressed or if symptoms reappear. The total daily dose of Methadone Hydrochloride Oral Solution on the first day of treatment should not ordinarily exceed 40 mg. Adjust the dose over the first week of treatment based on control of withdrawal symptoms at the time of expected peak activity (e.g., 2 to 4 hours after dosing). When adjusting the dose, keep in mind that methadone levels will accumulate over the first several days of dosing; deaths have occurred in early treatment due to the cumulative effects. Instruct patients that the dose will "hold" for a longer period of time as tissue stores of methadone accumulate. Short-Term Detoxification: For a brief course of stabilization followed by a period of medically supervised withdrawal, titrate the patient to a total daily dose of about 40 mg in divided doses to achieve an adequate stabilizing level. After 2 to 3 days of stabilization, gradually decrease the dose of Methadone Hydrochloride Oral Solution. Decrease the dose of Methadone Hydrochloride Oral Solution on a daily basis or at 2-day intervals, keeping the amount of Methadone Hydrochloride Oral Solution sufficient to keep withdrawal symptoms at a tolerable level. Hospitalized patients may tolerate a daily reduction of 20% of the total daily dose. Ambulatory patients may need a slower schedule. Titrate patients in maintenance treatment to a dose that prevents opioid withdrawal symptoms for 24 hours, reduces drug hunger or craving, and blocks or attenuates the euphoric effects of self-administered opioids, ensuring that the patient is tolerant to the sedative effects of methadone. Most commonly, clinical stability is achieved at doses between 80 to 120 mg/day. During prolonged administration of methadone, monitor patients for persistent constipation and manage accordingly. Methadone clearance may be increased during pregnancy. During pregnancy, a woman's methadone dose may need to be increased or the dosing interval decreased. Methadone should be used in pregnancy only if the potential benefit justifies the potential risk to the fetus [see Use in Specific Populations (8.1)]. Each 5 mL of orange Methadone Hydrochloride Oral Solution contains methadone hydrochloride 5 mg or 10 mg. The concentration of the 5 mg per 5 mL solution is 1 mg/mL and the concentration of the 10 mg per 5 mL solution is 2 mg/mL. Hypersensitivity (e.g., anaphylaxis) to methadone [see Adverse Reactions (6)]. Dosing errors can result in accidental overdose and death. Avoid dosing errors that may result from confusion between mg and mL and confusion with methadone hydrochloride oral solution of different concentrations, when prescribing, dispensing, and administering Methadone Hydrochloride Oral Solution. Ensure that the dose is communicated clearly and dispensed accurately. A household teaspoon or tablespoon is not an adequate measuring device. Given the inexactitude of the household spoon measure and the possibility of using a tablespoon instead of a teaspoon, which could lead to overdosage, it is strongly recommended that caregivers obtain and use a calibrated measuring device. Healthcare providers should recommend a calibrated device that can measure and deliver the prescribed dose accurately, and instruct caregivers to use extreme caution in measuring the dosage. Methadone Hydrochloride Oral Solution contains methadone, a Schedule II controlled substance. As an opioid, Methadone Hydrochloride Oral Solution exposes users to the risks of addiction, abuse, and misuse. As long-acting opioids such as Methadone Hydrochloride Oral Solution have pharmacological effects over an extended period of time, there is a greater risk for overdose and death [see Drug Abuse and Dependence (9)]. Although the risk of addiction in any individual is unknown, it can occur in patients appropriately prescribed Methadone Hydrochloride Oral Solution, and in those who obtain the drug illicitly. Addiction can occur at recommended doses and if the drug is misused or abused. Assess each patient’s risk for opioid addiction, abuse, or misuse prior to prescribing Methadone Hydrochloride Oral Solution and monitor all patients receiving Methadone Hydrochloride Oral Solution for the development of these behaviors or conditions. Risks are increased in patients with a personal or family history of substance abuse (including drug or alcohol addiction or abuse) or mental illness (e.g., major depression). The potential for these risks should not, however, prevent the prescribing of Methadone Hydrochloride Oral Solution for the proper management of pain in any given patient. Patients at increased risk may be prescribed opioids such as Methadone Hydrochloride Oral Solution, but use in such patients necessitates intensive counseling about the risks and proper use of Methadone Hydrochloride Oral Solution along with the intensive monitoring for signs of addiction, abuse, and misuse. Opioids are sought by drug abusers and people with addiction disorders and are subject to criminal diversion. Consider these risks when prescribing or dispensing Methadone Hydrochloride Oral Solution. Strategies to reduce these risks include prescribing the drug in the smallest appropriate quantity and advising the patient on the proper disposal of unused drug [see Patient Counseling Information (17)]. Contact local state professional licensing board or state controlled substances authority for information on how to prevent and detect abuse or diversion of this product. Complete a REMS-compliant education program offered by an accredited provider of continuing education (CE) or another education program that includes all the elements of the FDA Education Blueprint for Healthcare Providers Involved in the Management or Support of Patients with Pain. Discuss the safe use, serious risks, and proper storage and disposal of opioid analgesics with patients and/or their caregivers every time these medicines are prescribed. The Patient Counseling Guide (PCG) can be obtained at this like: www.fda.gov/OpioidAnalgesicREMSPCG. While serious, life-threatening, or fatal respiratory depression can occur at any time during the use of Methadone Hydrochloride Oral Solution, the risk is greatest during the initiation of therapy or following a dose increase. The peak respiratory depressant effect of methadone occurs later, and persists longer than the peak analgesic effect, especially during the initial dosing period. Closely monitor patients for respiratory depression when initiating therapy with Methadone Hydrochloride Oral Solution and following dose increases. To reduce the risk of respiratory depression, proper dosing and titration of Methadone Hydrochloride Oral Solution are essential [see Dosage and Administration (2.3, 2.4)]. Overestimating the Methadone Hydrochloride Oral Solution dosage when converting patients from another opioid product can result in fatal overdose with the first dose. Accidental ingestion of even one dose of methadone, especially by children, can result in respiratory depression and death due to overdose of methadone. Only initiate Methadone Hydrochloride Oral Solution therapy for pain in patients for whom the anticipated benefit outweighs the risk of QT prolongation and development of dysrhythmias that have been reported with high doses of methadone. Neonatal opioid withdrawal syndrome (NOWS) is an expected and treatable outcome of prolonged use of opioids during pregnancy, whether that use is medically-authorized or illicit. Unlike opioid withdrawal syndrome in adults, NOWS may be life-threatening if not recognized and treated in the neonate. Advise the patient of the risk of NOWS so that appropriate planning for management of the neonate can occur. Healthcare professionals should observe newborns for signs of NOWS and manage accordingly [see Use in Special Populations (8.1)]. The balance between the risks of NOWS and the benefits of maternal Methadone Hydrochloride Oral Solution use may differ based on the risks associated with the mother's underlying condition, pain or addiction, and the risks of the alternative treatments. Concomitant use of Methadone Hydrochloride Oral Solution with CYP3A4, CYP2B6, CYP2C19, CYP2C9, or CYP2D6 inhibitors, may increase plasma concentrations of methadone, prolong opioid adverse reactions, and may cause potentially fatal respiratory depression, particularly when an inhibitor is added after a stable dosage of Methadone Hydrochloride Oral Solution is achieved. Similarly, discontinuation of concomitant CYP3A4, CYP2B6, CYP2C19, or CYP2C9 inducers in Methadone Hydrochloride Oral Solution-treated patients may increase methadone plasma concentrations resulting in fatal respiratory depression. Consider dosage reduction of Methadone Hydrochloride Oral Solution when using concomitant CYP3A4, CYP2B6, CYP2C19, CYP2C9, or CYP2D6 inhibitors or discontinuing CYP3A4, CYP2B6, CYP2C19, or CYP2C9 inducers in methadone-treated patients, and follow patients closely at frequent intervals for signs and symptoms of respiratory depression and sedation [see Drug Interactions (7)]. Addition of CYP3A4, CYP2B6, CYP2C19, or CYP2C9 inducers or discontinuation of CYP3A4, CYP2B6, CYP2C19, CYP2C9, or CYP2D6 inhibitors in patients treated with Methadone Hydrochloride Oral Solution may decrease methadone plasma concentrations, reducing efficacy and may lead to opioid withdrawal symptoms in patients physically dependent on methadone. When using Methadone Hydrochloride Oral Solution with CYP3A4, CYP2B6, CYP2C19, or CYP2C9 inducers or discontinuing CYP3A4, CYP2B6, CYP2C19, CYP2C9, or CYP2D6 inhibitors, follow patients for signs or symptoms of opioid withdrawal and consider increasing the Methadone Hydrochloride Oral Solution dosage as needed [see Drug Interactions (7)]. Profound sedation, respiratory depression, coma, and death may result from the concomitant use of Methadone Hydrochloride Oral Solution with benzodiazepines or other CNS depressants (e.g., non-benzodiazepine sedatives/hypnotics, anxiolytics, tranquilizers, muscle relaxants, general anesthetics, antipsychotics, other opioids, alcohol). Advise both patients and caregivers about the risks of respiratory depression and sedation when Methadone Hydrochloride Oral Solution is used with benzodiazepines or other CNS depressants (including alcohol and illicit drugs). Advise patients not to drive or operate heavy machinery until the effects of concomitant use of the benzodiazepine or other CNS depressant have been determined. Screen patients for risk of substance use disorders, including opioid abuse and misuse, and warn them of the risk for overdose and death associated with the use of additional CNS depressants including alcohol and illicit drugs [see Drug Interactions (7), Patient Counseling Information (17)]. The use of Methadone Hydrochloride Oral Solution in patients with acute or severe bronchial asthma in an unmonitored setting or in the absence of resuscitative equipment is contraindicated. Methadone Hydrochloride Oral Solution-treated patients with significant chronic obstructive pulmonary disease or cor pulmonale, and those with a substantially decreased respiratory reserve, hypoxia, hypercapnia, or pre-existing respiratory depression are at increased risk of decreased respiratory drive including apnea, even at recommended dosages of Methadone Hydrochloride Oral Solution [see Warnings and Precautions (5.4)]. Life-threatening respiratory depression is more likely to occur in elderly, cachectic, or debilitated patients because they may have altered pharmacokinetics or altered clearance compared to younger, healthier patients [see Warnings and Precautions (5.4)]. Monitor such patients closely, particularly when initiating and titrating Methadone Hydrochloride Oral Solution and when Methadone Hydrochloride Oral Solution are given concomitantly with other drugs that depress respiration [see Warnings and Precautions (5.4, 5.8)]. Alternatively, consider the use of non-opioid analgesics in these patients. Cases of serotonin syndrome, a potentially life-threatening condition, have been reported during concomitant use of Methadone Hydrochloride Oral Solution with serotonergic drugs. Serotonergic drugs include selective serotonin reuptake inhibitors (SSRIs), serotonin and norepinephrine reuptake inhibitors (SNRIs), tricyclic antidepressants (TCAs), triptans, 5- HT3 receptor antagonists, drugs that affect the serotonergic neurotransmitter system (e.g., mirtazapine, trazodone, tramadol), and drugs that impair metabolism of serotonin (including MAO inhibitors, both those intended to treat psychiatric disorders and also others, such as linezolid and intravenous methylene blue) [see Drug Interactions (7)]. This may occur within the recommended dosage range. Serotonin syndrome symptoms may include mental status changes (e.g., agitation, hallucinations, coma), autonomic instability (e.g., tachycardia, labile blood pressure, hyperthermia), neuromuscular aberrations (e.g., hyperreflexia, incoordination, rigidity), and/or gastrointestinal symptoms (e.g., nausea, vomiting, diarrhea). The onset of symptoms generally occurs within several hours to a few days of concomitant use, but may occur later than that. Discontinue Methadone Hydrochloride Oral Solution if serotonin syndrome is suspected. Cases of adrenal insufficiency have been reported with opioid use, more often following greater than one 1 month of use. Presentation of adrenal insufficiency may include non-specific symptoms and signs including nausea, vomiting, anorexia, fatigue, weakness, dizziness, and low blood pressure. If adrenal insufficiency is suspected, confirm the diagnosis with diagnostic testing as soon as possible. If adrenal insufficiency is diagnosed, treat with physiologic replacement doses of corticosteroids. Wean the patient off of the opioid to allow adrenal function to recover and continue corticosteroid treatment until adrenal function recovers. Other opioids may be tried as some cases reported use of a different opioid without recurrence of adrenal insufficiency. The information available does not identify any particular opioids as being more likely to be associated with adrenal insufficiency. Methadone Hydrochloride Oral Solution may cause severe hypotension including orthostatic hypotension and syncope in ambulatory patients. There is an increased risk in patients whose ability to maintain blood pressure has already been compromised by a reduced blood volume or concurrent administration of certain CNS depressant drugs (e.g. phenothiazines or general anesthetics) [see Drug Interactions (7)]. Monitor these patients for signs of hypotension after initiating or titrating the dosage of Methadone Hydrochloride Oral Solution. In patients with circulatory shock, Methadone Hydrochloride Oral Solution may cause vasodilation that can further reduce cardiac output and blood pressure. Avoid the use of Methadone Hydrochloride Oral Solution in patients with circulatory shock. In patients who may be susceptible to the intracranial effects of CO2 retention (e.g., those with evidence of increased intracranial pressure or brain tumors) Methadone Hydrochloride Oral Solution may reduce respiratory drive, and the resultant CO2 retention can further increase intracranial pressure. Monitor such patients for signs of sedation and respiratory depression, particularly when initiating therapy with Methadone Hydrochloride Oral Solution. Avoid the use of Methadone Hydrochloride Oral Solution in patients with impaired consciousness or coma. Methadone Hydrochloride Oral Solution is contraindicated in patients with known or suspected gastrointestinal obstruction, including paralytic ileus. The methadone in Methadone Hydrochloride Oral Solution may cause spasm of the sphincter of Oddi. Opioids may cause increases in the serum amylase. Monitor patients with biliary tract disease, including acute pancreatitis, for worsening symptoms. The methadone in Methadone Hydrochloride Oral Solution may increase the frequency of seizures in patients with seizure disorders, and may increase the risk of seizures in other clinical settings associated with seizures. Monitor patients with a history of seizure disorders for worsened seizure control during Methadone Hydrochloride Oral Solution therapy. Avoid the use of mixed agonist/antagonist (i.e., pentazocine, nalbuphine, and butorphanol) or partial agonist (e.g., buprenorphine) analgesics in patients who are receiving a full opioid agonist, including Methadone Hydrochloride Oral Solution. In these patients, mixed agonists/antagonist and partial agonist analgesics may reduce the analgesic effect and/or may precipitate withdrawal symptoms [see Drug Interactions (7)]. When discontinuing Methadone Hydrochloride Oral Solution, gradually taper the dosage [see Dosage and Administration (2.5)]. Do not abruptly discontinue Methadone Hydrochloride Oral Solution [see Drug Abuse and Dependence (9.3)]. Methadone Hydrochloride Oral Solution may impair the mental or physical abilities needed to perform potentially hazardous activities such as driving a car or operating machinery. Warn patients not to drive or operate dangerous machinery unless they are tolerant to the effects of methadone and know how they will react to the medication [see Patient Counseling Information (17)]. The most frequently observed adverse reactions include lightheadedness, dizziness, sedation, nausea, vomiting and sweating. These effects seem to be more prominent in ambulatory patients and in those who are not suffering severe pain. In such individuals, lower doses are advisable. Hypersensitivity: Anaphylaxis has been reported with ingredients contained in Methadone Hydrochloride Oral Solution. Methadone undergoes hepatic N-demethylation by several cytochrome P450 (CYP) isoforms, including CYP3A4, CYP2B6, CYP2C19, CYP2C9, and CYP2D6. The concomitant use of Methadone Hydrochloride Oral Solution and CYP3A4, CYP2B6, CYP2C19, CYP2C9, or CYP2D6 inhibitors can increase the plasma concentration of methadone, resulting in increased or prolonged opioid effects, and may result in a fatal overdose, particularly when an inhibitor is added after a stable dose of Methadone Hydrochloride Oral Solution is achieved. These effects may be more pronounced with concomitant use of drugs that inhibit more than one of the CYP enzymes listed above. After stopping a CYP3A4, CYP2B6, CYP2C19, CYP2C9, or CYP2D6 inhibitor, as the effects of the inhibitor decline, the methadone plasma concentration can decrease [see Clinical Pharmacology (12.3)], resulting in decreased opioid efficacy or withdrawal symptoms in patients physically dependent on methadone. If concomitant use is necessary, consider dosage reduction of Methadone Hydrochloride Oral Solution until stable drug effects are achieved. Monitor patients for respiratory depression and sedation at frequent intervals. If a CYP3A4, CYP2B6, CYP2C19, CYP2C9, or CYP2D6 inhibitor is discontinued, follow patients for signs of opioid withdrawal and consider increasing the Methadone Hydrochloride Oral Solution dosage until stable drug effects are achieved. The concomitant use of Methadone Hydrochloride Oral Solution and CYP3A4, CYP2B6, CYP2C19, or CYP2C9 inducers can decrease the plasma concentration of methadone [see Clinical Pharmacology (12.3)], resulting in decreased efficacy or onset of withdrawal symptoms in patients physically dependent on methadone. These effects could be more pronounced with concomitant use of drugs that can induce multiple CYP enzymes. If concomitant use is necessary, consider increasing the Methadone Hydrochloride Oral Solution dosage until stable drug effects are achieved. Monitor for signs of opioid withdrawal. If a CYP3A4, CYP2B6, CYP2C19, or CYP2C9 inducer is discontinued, consider Methadone Hydrochloride Oral Solution dosage reduction and monitor for signs of respiratory depression and sedation. Reserve concomitant prescribing of these drugs for use in patients for whom alternative treatment options are inadequate. Limit dosages and durations to the minimum required. Follow patients closely for signs of respiratory depression and sedation [see Warnings and Precautions (5.8)]. The concomitant use of opioids with other drugs that affect the serotonergic neurotransmitter system has resulted in serotonin syndrome [see Warnings and Precautions (5.10)]. If concomitant use is warranted, carefully observe the patient, particularly during treatment initiation and dose adjustment. Discontinue Methadone Hydrochloride Oral Solution if serotonin syndrome is suspected. MAOI interactions with opioids may manifest as serotonin syndrome [see Warnings and Precautions (5.10)] or opioid toxicity (e.g., respiratory depression, coma) [see Warnings and Precautions (5.4)]. The use of Methadone Hydrochloride Oral Solution is not recommended for patients taking MAOIs or within 14 days of stopping such treatment. May reduce the analgesic effect of Methadone Hydrochloride Oral Solution and/or precipitate withdrawal symptoms. Monitor patients for signs of respiratory depression that may be greater than otherwise expected and decrease the dosage of Methadone Hydrochloride Oral Solution and/or the muscle relaxant as necessary. Monitor patients for signs of urinary retention or reduced gastric motility when Methadone Hydrochloride Oral Solution are used concomitantly with anticholinergic drugs. Concurrent use of certain antiretroviral agents with CYP3A4 inhibitory activity, alone and in combination, such as abacavir, amprenavir, darunavir+ritonavir, efavirenz, nelfinavir, nevirapine, ritonavir, telaprevir, lopinavir+ritonavir, saquinavir+ritonavir, and tipranavir+ritonavir, has resulted in increased clearance or decreased plasma levels of methadone. This may result in reduced efficacy of Methadone Hydrochloride Oral Solution and could precipitate a withdrawal syndrome. Monitor methadone-maintained patients receiving any of these anti-retroviral therapies closely for evidence of withdrawal effects and adjust the methadone dose accordingly. Zidovudine: Experimental evidence demonstrated that methadone increased the AUC of zidovudine, which could result in toxic effects. Pregnant women in methadone maintenance programs may have reduced incidence of obstetric and fetal complications and neonatal morbidity and mortality when compared to women using illicit drugs. Untreated opioid addiction in pregnancy is associated with adverse obstetrical outcomes and risk of continued or relapsing illicit opioid use. These risks should be considered in women treated with Methadone Hydrochloride Oral Solution for maintenance treatment of opioid addiction. For women treated with Methadone Hydrochloride Oral Solution for pain severe enough to require daily, around-the-clock, long-term opioid treatment, Methadone Hydrochloride Oral Solution should be used during pregnancy only if the potential benefit justifies the potential risk to the fetus. Fetal/neonatal adverse reactions: Neonatal opioid withdrawal syndrome may occur in newborn infants of mothers who are receiving treatment with Methadone Hydrochloride Oral Solution. Neonatal opioid withdrawal syndrome presents as irritability, hyperactivity and abnormal sleep pattern, high pitched cry, tremor, vomiting, diarrhea, and/or failure to gain weight. Signs of neonatal withdrawal usually occur in the first days after birth. The duration and severity of neonatal opioid withdrawal syndrome may vary. Observe newborns for signs of neonatal opioid withdrawal syndrome and manage accordingly [see Warnings and Precautions (5.6)]. Labor or Delivery: Opioids cross the placenta and may produce respiratory depression and psycho-physiologic effects in neonates. An opioid antagonist, such as naloxone, must be available for reversal of opioid-induced respiratory depression in the neonate. Use of Methadone Hydrochloride Oral Solution as an analgesic is not recommended for pregnant women during or immediately prior to labor, when use of shorter-acting analgesics or other analgesic techniques are more appropriate. Opioid analgesics, including Methadone Hydrochloride Oral Solution can prolong labor through actions which temporarily reduce the strength, duration, and frequency of uterine contractions. However, this effect is not consistent and may be offset by an increased rate of cervical dilation, which tends to shorten labor. Monitor neonates exposed to opioid analgesics during labor for signs of excess sedation and respiratory depression. Chronic use of opioids may cause reduced fertility in females and males of reproductive potential. It is not known whether these effects on fertility are reversible [see Adverse Reactions (6), Clinical Pharmacology (12.2), Nonclinical Pharmacology (13.1)]. Reproductive function in human males may be decreased by methadone treatment. Reductions in ejaculate volume and seminal vesicle and prostate secretions have been reported in methadone-treated individuals. In addition, reductions in serum testosterone levels and sperm motility, and abnormalities in sperm morphology have been reported. Respiratory depression is the chief risk for elderly patients treated with opioids, and has occurred after large initial doses were administered to patients who were not opioid-tolerant or when opioids were co-administered with other agents that depress respiration. Titrate the dosage of Methadone Hydrochloride Oral Solution slowly in geriatric patients and monitor closely for signs of central nervous system and respiratory depression [see Warnings and Precautions (5.9)]. Methadone Hydrochloride Oral Solution contains methadone, a Schedule II controlled substance. Methadone Hydrochloride Oral Solution contains methadone, a substance with a high potential for abuse similar to other opioids including fentanyl, hydrocodone, hydromorphone, morphine, oxycodone, oxymorphone, and tapentadol. Methadone Hydrochloride Oral Solution can be abused and is subject to misuse, addiction, and criminal diversion [see Warnings and Precautions (5.2)]. “Drug-seeking” behavior is very common in addicts and drug abusers. Drug-seeking tactics include emergency calls or visits near the end of office hours, refusal to undergo appropriate examination, testing or referral, repeated claims of lost prescriptions, tampering with prescriptions and reluctance to provide prior medical records or contact information for other treating physician(s). “Doctor shopping” (visiting multiple prescribers) to obtain additional prescriptions is common among drug abusers and people suffering from untreated addiction. Preoccupation with achieving adequate pain relief can be appropriate behavior in a patient with poor pain control. Methadone Hydrochloride Oral Solution, like other opioids, can be diverted for non-medical use into illicit channels of distribution. Careful record- keeping of prescribing information, including quantity, frequency, and renewal requests as required by state and federal law, is strongly advised. Abuse of Methadone Hydrochloride Oral Solution poses a risk of overdose and death. This risk is increased with concurrent abuse of methadone and other substances. Methadone Hydrochloride Oral Solution is for oral use only and must not be injected. With intravenous abuse the inactive ingredients in Methadone Hydrochloride Oral Solution can result in local tissue necrosis, infection, pulmonary granulomas, embolism and death, and increased risk of endocarditis and valvular heart injury. Parenteral drug abuse is commonly associated with transmission of infectious diseases such as hepatitis and HIV. Physical dependence results in withdrawal symptoms after abrupt discontinuation or a significant dosage reduction of a drug. Withdrawal also may be precipitated through the administration of drugs with opioid antagonist activity, (e.g., naloxone, nalmefene), mixed agonist/antagonist analgesics (e.g., pentazocine, butorphanol, nalbuphine), or partial agonists (e.g., buprenorphine). Physical dependence may not occur to a clinically significant degree until after several days to weeks of continued opioid usage. Methadone Hydrochloride Oral Solution should not be abruptly discontinued [see Dosage and Administration (2.5)]. If Methadone Hydrochloride Oral Solution is abruptly discontinued in a physically dependent patient, abstinence withdrawal syndrome may occur. Some or all of the following can characterize this syndrome: restlessness, lacrimation, rhinorrhea, yawning, perspiration, chills, myalgia, and mydriasis. Other signs and symptoms also may develop, including irritability, anxiety, backache, joint pain, weakness, abdominal cramps, insomnia, nausea, anorexia, vomiting, diarrhea, or increased blood pressure, respiratory rate, or heart rate. Acute overdose of methadone can be manifested by respiratory depression, somnolence progressing to stupor or coma, skeletal-muscle flaccidity, cold and clammy skin, constricted pupils, and, in some cases, pulmonary edema, bradycardia, hypotension, partial or complete airway obstruction, atypical snoring, and death. Marked mydriasis rather than miosis may be seen with hypoxia in overdose situations [see Clinical Pharmacology (12.2)]. In severe overdosage, particularly by the intravenous route, apnea, circulatory collapse, cardiac arrest, and death may occur. Because the duration of reversal would be expected to be less than the duration of action of methadone in Methadone Hydrochloride Oral Solution, carefully monitor the patient until spontaneous respiration is reliably re-established. If the response to opioid antagonists is suboptimal or not sustained, administer additional antagonist as directed in the product’s prescribing information. In an individual physically dependent on opioids, administration of the recommended usual dosage of antagonist will precipitate an acute withdrawal syndrome. The severity of the withdrawal symptoms experience will depend on the degree of physical dependence and the dose of the antagonist administered. If a decision is made to treat serious respiratory depression in the physically dependent patient, administration of the antagonist should be begun with care and by titration with smaller than usual doses of the antagonist. Methadone hydrochloride is chemically described as 6-(dimethylamino)-4,4-diphenyl-3-hepatanone hydrochloride. Methadone hydrochloride is a white, crystalline material that is water-soluble. 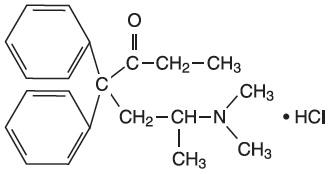 Its molecular formula is C21H27NO∙HCl and it has a molecular weight of 345.91. Methadone hydrochloride has a melting point of 235°C, and a pKa of 8.25 in water at 20°C. Its octanol/water partition coefficient at pH 7.4 is 117. A solution (1:100) in water has a pH between 4.5 and 6.5. Each 5 mL of oral solution contains 5 or 10 mg of Methadone Hydrochloride USP and the following inactive ingredients: alcohol (9.8% v/v), artificial wild cherry flavor, benzoic acid, citric acid, D&C Red #33, FD&C Red #40, glycerin, sorbitol, and water. Methadone hydrochloride is a mu-agonist; a synthetic opioid analgesic with multiple actions qualitatively similar to those of morphine, the most prominent of which involves the central nervous system and organs composed of smooth muscle. The principal therapeutic uses for methadone are for analgesia and for detoxification or maintenance in opioid addiction. The methadone withdrawal syndrome, although qualitatively similar to that of morphine, differs in that the onset is slower, the course is more prolonged, and the symptoms are less severe. Some data also indicate that methadone acts as an antagonist at the N-methyl-D-aspartate (NMDA) receptor. The contribution of NMDA receptor antagonism to methadone's efficacy is unknown. Metabolism: Methadone is primarily metabolized by N-demethylation to an inactive metabolite, 2-ethylidene-1,5- dimethyl-3,3-diphenylpyrrolidene (EDDP). Cytochrome P450 enzymes, primarily CYP3A4, CYP2B6, CYP2C19, CYP2C9, and CYP2D6, are responsible for conversion of methadone to EDDP and other inactive metabolites, which are excreted mainly in the urine. Methadone appears to be a substrate for P-glycoprotein but its pharmacokinetics do not appear to be significantly altered in case of P-glycoprotein polymorphism or inhibition. Cytochrome P450 Interactions: Methadone undergoes hepatic N-demethylation by cytochrome P450 (CYP) isoforms, principally CYP3A4, CYP2B6, CYP2C19, and to a lesser extent by CYP2C9 and CYP2D6. Coadministration of methadone with CYP inducers may result in more rapid metabolism and potential for decreased effects of methadone, whereas administration with CYP inhibitors may reduce metabolism and potentiate methadone's effects. Although antiretroviral drugs such as efavirenz, nelfinavir, nevirapine, ritonavir, lopinavir+ritonavir combination are known to inhibit some CYPs, they are shown to reduce the plasma levels of methadone, possibly due to CYP induction activity [see Drug Interactions (7)]. Phenytoin: In a pharmacokinetic study with patients on methadone maintenance therapy, phenytoin administration (250 mg twice daily initially for 1 day followed by 300 mg daily for 3 to 4 days) resulted in an approximately 50% reduction in methadone exposure and withdrawal symptoms occurred concurrently. Upon discontinuation of phenytoin, the incidence of withdrawal symptoms decreased and methadone exposure increased to a level comparable to that prior to phenytoin administration. St. John's Wort, Phenobarbital, Carbamazepine: Administration of methadone with other CYP3A4 inducers may result in withdrawal symptoms. Voriconazole: Voriconazole can inhibit the activity of CYP3A4, CYP2C9, and CYP2C19. Repeat dose administration of oral voriconazole (400 mg every 12 hours for 1 day, then 200 mg every 12 hours for 4 days) increased the peak plasma concentration (Cmax) and AUC of (R)-methadone by 31% and 47%, respectively, in subjects receiving a methadone maintenance dose (30 to 100 mg daily). The Cmax and AUC of (S)-methadone increased by 65% and 103%, respectively. Increased plasma concentrations of methadone have been associated with toxicity including QT prolongation. Frequent monitoring for adverse events and toxicity related to methadone is recommended during coadministration. Dose reduction of methadone may be needed [see Drug Interactions (7)]. Abacavir, amprenavir, darunavir+ritonavir, efavirenz, nelfinavir, nevirapine, ritonavir, telaprevir, lopinavir+ritonavir, saquinavir+ritonavir, tipranavir+ritonavir combination: Coadministration of these anti-retroviral agents resulted in increased clearance or decreased plasma levels of methadone [see Drug Interactions (7)]. Zidovudine: Methadone increased the AUC of zidovudine which could result in toxic effects [see Drug Interactions (7)]. The results of carcinogenicity assessment in B6C2F1 mice and Fischer 344 rats following dietary administration of two doses of methadone HCl have been published. Mice consumed 15 mg/kg/day or 60 mg/kg/day methadone for two years. These doses were approximately 0.6 and 2.5 times a human daily oral dose of 120 mg/day on a body surface area basis (HDD). There was a significant increase in pituitary adenomas in female mice treated with 15 mg/kg/day but not with 60 mg/kg/day. Under the conditions of the assay, there was no clear evidence for a treatment-related increase in the incidence of neoplasms in male rats. Due to decreased food consumption in males at the high dose, male rats consumed 16 mg/kg/day and 28 mg/kg/day of methadone for two years. These doses were approximately 1.3 and 2.3 times the HDD. In contrast, female rats consumed 46 mg/kg/day or 88 mg/kg/day for two years. These doses were approximately 3.7 and 7.1 times the HDD. Under the conditions of the assay, there was no clear evidence for a treatment-related increase in the incidence of neoplasms in either male or female rats. Methadone is a controlled substance. Like fentanyl, morphine, oxycodone, hydromorphone, and oxymorphone, methadone is controlled under Schedule II of the Federal Controlled Substances Act. Methadone may be targeted for theft and diversion by criminals [see Warnings and Precautions (5.1)]. 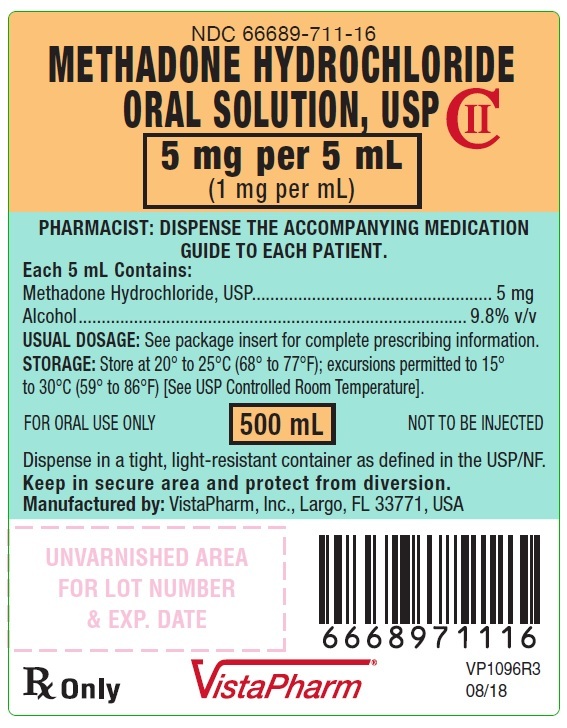 Instruct patients how to measure and take the correct dose of Methadone Hydrochloride Oral Solution and to always use a calibrated measuring device when administering Methadone Hydrochloride Oral Solution to ensure the dose is measured and administered accurately [see Warnings and Precautions (5.1)]. Advise patients that Methadone Hydrochloride Oral Solution, is available in two concentrations: 5 mg/5 mL and 10 mg/5 mL. Inform patients about which concentration they have been prescribed and provide detailed instruction on how to measure and take the correct dose of Methadone Hydrochloride Oral Solution, and to always use the enclosed measuring device when administering Methadone Hydrochloride Oral Solution, to ensure that the dose is measured and administered accurately. Inform patients that the use of Methadone Hydrochloride Oral Solution, even when taken as recommended, can result in addiction, abuse, and misuse, which can lead to overdose or death [see Warnings and Precautions (5.2)]. Instruct patients not to share Methadone Hydrochloride Oral Solution with others and to take steps to protect Methadone Hydrochloride Oral Solution from theft or misuse. Inform patients of the risk of life-threatening respiratory depression, including information that the risk is greatest when starting Methadone Hydrochloride Oral Solution or when the dosage is increased, and that it can occur even at recommended dosages [see Warnings and Precautions (5.4)]. Advise patients how to recognize respiratory depression and to seek medical attention if breathing difficulties develop. Inform patients that accidental ingestion, especially by children, may result in respiratory depression or death [see Warnings and Precautions (5.4)]. Instruct patients to take steps to store Methadone Hydrochloride Oral Solution securely and to dispose of unused Methadone Hydrochloride Oral Solution by flushing the solution down the toilet. Instruct patients to seek medical attention immediately if they experience symptoms suggestive of an arrhythmia (such as palpitations, near syncope, or syncope) when taking Methadone Hydrochloride Oral Solution [see Warnings and Precautions (5.5)]. Inform patients and caregivers that potentially fatal additive effects may occur if Methadone Hydrochloride Oral Solution is used with benzodiazepines or other CNS depressants, including alcohol, and not to use these concomitantly unless supervised by a healthcare provider [see Warnings and Precautions (5.8), Drug Interactions (7)]. Inform patients that Methadone Hydrochloride Oral Solution could cause a rare but potentially life-threatening condition resulting from concomitant administration of serotonergic drugs. Warn patients of the symptoms of serotonin syndrome and to seek medical attention right away if symptoms develop. Instruct patients to inform their physicians if they are taking, or plan to take serotonergic medications [see Warnings and Precautions (5.10), Drug Interactions (7)]. Inform patients to avoid taking Methadone Hydrochloride Oral Solution while using any drugs that inhibit monoamine oxidase. Patients should not start MAOIs while taking Methadone Hydrochloride Oral Solution [see Warnings and Precautions (5.10), Drug Interactions (7)]. Inform patients that Methadone Hydrochloride Oral Solution could cause adrenal insufficiency, a potentially life-threatening condition. Adrenal insufficiency may present with non-specific symptoms and signs such as nausea, vomiting, anorexia, fatigue, weakness, dizziness, and low blood pressure. Advise patients to seek medical attention if they experience a constellation of these symptoms [see Warnings and Precautions (5.11)]. Advise patients to always use a calibrated oral syringe/dosing cup when administering Methadone Hydrochloride Oral Solution to ensure the dose is measured and administered accurately [see Warnings and Precautions (5.1)]. Advise patients never to use household teaspoons or tablespoons to measure Methadone Hydrochloride Oral Solution. Do not discontinue Methadone Hydrochloride Oral Solution without first discussing the need for a tapering regimen with the prescriber [see Warnings and Precautions (5.16)]. Inform patients that Methadone Hydrochloride Oral Solution may cause orthostatic hypotension and syncope. Instruct patients how to recognize symptoms of low blood pressure and how to reduce the risk of serious consequences should hypotension occur (e.g., sit or lie down, carefully rise from a sitting or lying position) [see Warnings and Precautions (5.12)]. Inform patients that anaphylaxis has been reported with ingredients contained in Methadone Hydrochloride Oral Solution. Advise patients how to recognize such a reaction and when to seek medical attention [see Contraindications (4), Adverse Reactions (6)]. Advise women that if they are pregnant while being treated with Methadone Hydrochloride Oral Solution, the baby may have signs of withdrawal at birth and that withdrawal is treatable [see Warnings and Precautions (5.6), Specific Populations (8.1)]. Inform female patients of reproductive potential that Methadone Hydrochloride Oral Solution can cause fetal harm and to inform their healthcare provider of a known or suspected pregnancy [see Use in Specific Populations (8.1)]. Instruct nursing mothers using Methadone Hydrochloride Oral Solution to watch for signs of methadone toxicity in their infants, which include increased sleepiness (more than usual), difficulty breastfeeding, breathing difficulties, or limpness. Instruct nursing mothers to talk to the baby's healthcare provider immediately if they notice these signs. If they cannot reach the healthcare provider right away, instruct them to take the baby to the emergency room or call 911 (or local emergency services) [see Use in Specific Populations (8.2)]. Inform patients that Methadone Hydrochloride Oral Solution may impair the ability to perform potentially hazardous activities such as driving a car or operating heavy machinery. Advise patients not to perform such tasks until they know how they will react to the medication [see Warnings and Precautions (5.17)]. Advise patients to flush the unused Methadone Hydrochloride Oral Solution down the toilet when methadone is no longer needed. Getemergency help right away if you take too much Methadone Hydrochloride Oral Solution (overdose). When you first start taking Methadone Hydrochloride Oral Solution, when your dose is changed, or if you take too much (overdose), serious or life-threatening breathing problems that can lead to death may occur. Taking Methadone Hydrochloride Oral Solution with other opioid medicines, benzodiazepines, alcohol, or other central nervous system depressants (including street drugs) can cause severe drowsiness, decreased awareness, breathing problems, coma, and death. Never give anyone your Methadone Hydrochloride Oral Solution. They could die from taking it. Store methadone away from children and in a safe place to prevent stealing or abuse. Selling or giving away Methadone Hydrochloride Oral Solution is against the law. pregnantor plan to become pregnant. If you take Methadone Hydrochloride Oral Solution while pregnant, your baby may have symptoms of opioid withdrawal or respiratory depression at birth. Talk to your doctor if you are pregnant or plan to become pregnant. breastfeeding.Methadone Hydrochloride Oral Solution passes into breast milk and may harm your baby. taking prescription or over-the-counter medicines, vitamins, or herbal supplements. Taking Methadone Hydrochloride Oral Solution with certain other medicines may cause serious side effects. Do not change your dose. Take Methadone Hydrochloride Oral Solution exactly as prescribed by your healthcare provider. Always use a calibrated measuring device for Methadone Hydrochloride Oral Solution to correctly measure your dose. A household teaspoon or tablespoon is not an adequate measuring device. Given the inexactitude of the household spoon measure and the possibility of using a tablespoon instead of a teaspoon, which could lead to overdosage, it is strongly recommended that caregivers obtain and use a calibrated measuring device. Do not take more than your prescribed dose in 24 hours. If you take Methadone Hydrochloride Oral Solution for pain and miss a dose, take Methadone Hydrochloride Oral Solution as soon as possible and then take your next dose 8 or 12 hours later as directed by your healthcare provider. If it is almost time for your next dose, skip the missed dose and go back to your regular dosing schedule. If you take Methadone Hydrochloride Oral Solution for opioid addiction and miss a dose, take your next dose the following day as scheduled. Do not take extra doses. Taking more than the prescribed dose may cause you to overdose because Methadone Hydrochloride Oral Solution builds up in your body over time. Do not stop taking Methadone Hydrochloride Oral Solutionwithout talkingto your healthcare provider. After you stop taking Methadone Hydrochloride Oral Solution, flush any unused solution down the toilet. Drive or operate heavy machinery, until you know how Methadone Hydrochloride Oral Solution affects you. Methadone can make you sleepy, dizzy, or lightheaded. Drink alcohol or use prescription or over-the-counter medicines that contain alcohol. Using products containing alcohol during treatment with Methadone Hydrochloride Oral Solution may cause you to overdose and die. These are not all the possible side effects of Methadone Hydrochloride Oral Solution. Call your doctor for medical advice about side effects. You may report side effects to FDA at 1-800-FDA-1088. For more information go to dailymed.nlm.nih.gov. USUAL DOSAGE: See Package Insert for Complete Prescribing Information. Dispense in tight, light-resistant container as in defined in the USP/NF. Keep in secure area and protect from diversion.